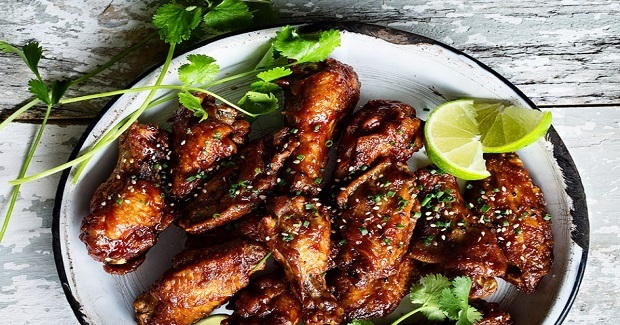 Sticky Coke Wings - Gutom Na! Posted on Monday, January 25th, 2016 at 10:32 am. Heat oven to 400°F. Line two large baking sheets with a wire rack. Divide wings between prepared racks and spread out in a single layer. Bake until wings are cooked through and skin is crispy, about about 45-50 minutes. Remove from oven and transfer wings to a plate. Prepare baking sheets once more by lining both baking sheets with foil and wire rack on top; set aside to prepare sauce. Place remaining ingredients in a large saucepan over medium high heat and bring to a boil, lower heat and let simmer until slightly reduced and thick, about 5-7 minutes. Toss wings in sauce. Evenly divide and place wings in a single layer on rack. Bake until glaze is glossy and lightly cartelized, about 8-10 minutes.